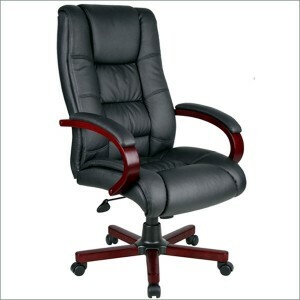 Executive chair with a modern design upholstered in the ultra soft, durable and breathable CarresoftPlus fabric. Cushion are filled with dacron and perforated in the center. Other features include the heavy duty 2 paddle spring tilt mechanism with infinite tilt lock and the pneumatic gas lift seat height adjustment. Available with a Mahogany or Cherry wood finish.